I designed and deployed a daily and weekly scorecard to measure the health of nike.com, our apps, and our social channels. Exploring everything from traffic and conversion to search and engagement, the scorecard marked the first time Digital Brand has ever measured results across channels on a daily basis. I get way too excited about corporate onboarding. Honestly, it's not normal. When I got to Nike and realized that there was no onboarding experience for Global Digital Brand, I scrambled to create one. I created tools for managers, a playbook for the new hires, and a gifting experience. The playbook, aptly named #swooshlife, was later repurposed by over five other departments at Nike and Global HR used it as a jumping-off point to create a new onboarding playbook for all of Nike. With a Digital Brand team of 300+ people, off-site meetings are usually more meet-and-greets than anything else. For an around-the-world series of off-site meetings I designed baseball cards for every team member and agency partner so that they could get to know each other better. Sometimes you work for a VP who loves bacon more than almost anything else in the world. Sometimes that VP needs a gift for his team; a team that eats, lives, and breathes digital, but loves taking notes analog-style in notebooks. Time to create a notebook that tells the tale of the three most famous bacons: Sir Francis, Francis, and Kevin. The copy is pretty small, even when you click on the images. If you want to fully immerse yourself in the experience, you can download the individual pages of the book here. In 2013, YouTube launched a series of new tools for businesses. I authored a white paper that explored why businesses should be using YouTube, showcased tools to enhance a business' YouTube presence, and introduced Oracle's newest social marketing tool: Gadgets. Ahhhhhh...My summer of solar. During my stint at Sungevity we expanded our residential solar services to the East Coast. 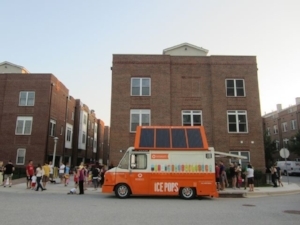 I partnered with agencies to design and build a solar-powered ice pop truck, and spent two months riding on the truck doing in-person outreach and solar education. In addition to in-person awareness events, the campaign included direct mail, radio, search, email, influencer outreach, and affiliate marketing. Leading a global team of Community Managers at a company as large and process-driven as P&G requires a robust set of standards and expectations, including a consistent approach to community management, whether the brand in question is Tide, Pantene, Crest, or Gillette. I authored a playbook for the 40+ Community Managers that included the fundamentals of community management, engagement guidelines, listening for insights, measurement, platform dos and don'ts, and more. From concepting and concept testing to forecasting and launch, I oversaw all consumer insights and market research for Gillette male skin care line extensions.